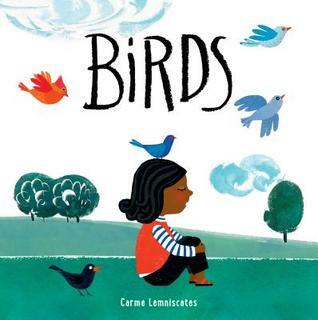 This picture book starts out describing bird behavior, but then halfway through, starts waxing poetic about how birds represent thoughts and friendship and freedom and that's where it loses me (and my three-year-old). There seems to be a bit of a trend now where kids' books use a lot of flowery language to make nonsensical pronouncements about the meaning of life, and it's definitely not working for me. The illustration style also fell flat for me, which is too bad, because often that is the only redeeming quality of these 32-page meditations. If you need good bird picture books, there are many, including: Birds by Kevin Henkes, Our Yard is Full of Birds by Anne Rockwell, A Year of Birds by Ashley Wolff, Birdsongs by Betsy Franco, Every Day Birds by Amy Ludwig VanDerwater, and Birdsong by Audrey Wood. Sign into Goodreads to see if any of your friends have read Birds.